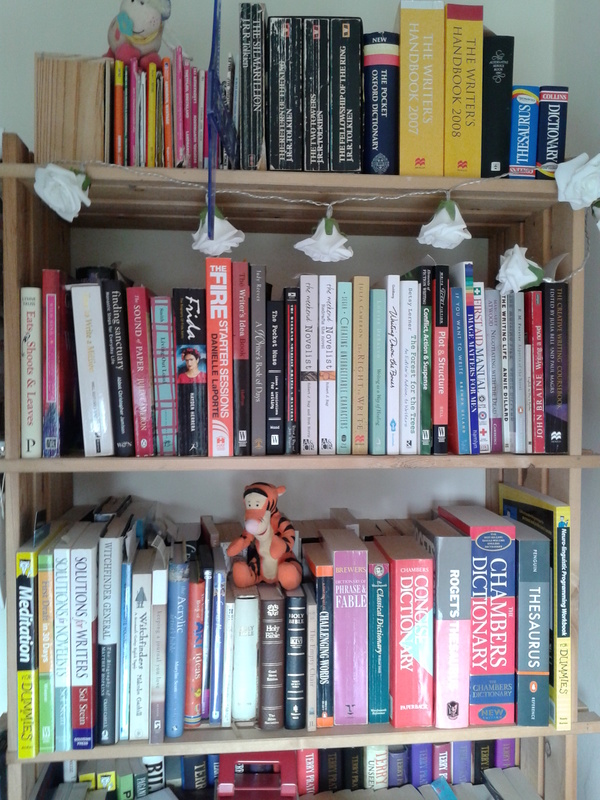 In the last post, I waxed lyrical about why you need a good dictionary on your bookself. Have it to hand when you are reading. Reading is an act of Input that every writer needs to undertake. And no, its not stealing. Its looking for inspiration, in the same way that artists study and copy the Old Masters in order to improve. Reading helps you learn what works and what doesn’t, but more on that another day. So that’s the Input. What about the Output? This is where the next book comes in – the writing part. If you are serious about making your writing more vivid, you’ll need a Thesaurus. I was introduced to Roget’s Thesaurus, probably the most famous thesaurus, while still at school, but the technique of using it is cumbersome and it completely foxed me. Now I use a very nice, fat Penguin Thesaurus, which is alphabetical, and quite thorough enough to meet my needs. I keep my Roget in reserve, just in case. And yes, I have finally worked out how to use it properly, but it’s a pain, so I keep things simple. Sorcerer, wizard, warlock, sorceress, witch, enchantress, necromancer, thaumaturge, miracle-worker. Mmmm. Never heard of thaumaturge before! That’s pretty exotic, as exotic goes. See what I mean? Grab yourself a thesaurus and have a moodle about within its pages. Yes, its perhaps just another way of defining words, but it defines around them too, enriching them in unexpected ways. It will help you widen your vocabulary but also makes your stories more sumptuous. As with anything rich, however, don’t go overboard. Too much cream can make you sick. Too many adjectives and adverbs (especially) will put your reader off completely. Its a case of using the right word, not lots and lots of words. Be vivid, not verbose. Yes, there are other reference books I rely on on a regular basis. I wouldn’t be without my Brewer’s Dictionary of Phrase and Fable, for example. Or The Oxford Companion to English Literature, and the Chambers Biographical Dictionary. All of them are fascinating and deeply useful – and not just when you are wrestling with a crossword! But they are not what I could call ‘necessary’. A dictionary and thesaurus are as necessary to a writer as a saw and chisel are to a carpenter. On a scale of need, they are prerequisites for the writing life. As you can see from the picture at the top of this post, I have lots of books about writing. I promise I will tell you about them in another post. In the meantime, ferret out a good dictionary and thesaurus and keep them close at hand. Look up any word you don’t recognise, and also those that you think you know what they mean, but have a lingering doubt about whether you are right. Write down the ones you really love, and use them. I promise you’ll have no regrets. This entry was posted in Dictionary, Language, Learning the Craft, reading, Thesaurus, Writing, Writing Every Day and tagged Chambers Biographical Dictionary, Chambers Dictionary, Reading, Roget's Thesaurus, Thesauri, Thesaurus, writers bookshelf, Writers Resources, Writing on 06.09.13 by evenlode1967. I agree with this, and a dictionary is useful for just about anyone.